Affiliates can earn a commission on Specimen Evaluation Form referrals sent to IdentifyUS. We provide interested parties with a snippet of code that you can embed on your own website that will direct your customers to an easy-to-use, online, co-branded Specimen Evaluation Form. If your end user audience has any interest in identifying a pest for whatever reason, consider joining our affiliates program. Schools and School Nurses - any school website can offer parents, students and school nurses quick and easy access to an independent expert who will authoritatively be able to identify nuisance pests like head lice, bed bugs, ticks and fleas. Physcians, medical practioners - who want to offer patients quick turnaround on authoritative arthropod IDs. Imagine a patient that has received a bug bite and has already submitted the speciment sample for identification prior to reaching the physcian's office seeking medical advice? For more information on how to get started and to register for you own Specimen Evaluation Form submission code that you can embed and co-brand on your own website contact us today. It's fast and easy! 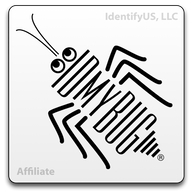 For more information about IdentifyUS Affiliates, click on the links below. We hope you'll consider using their products and/or services if there is a match there for you.